Inspired by the novel “The Penalty” by Gouverneur Morris, and its film adaptation written by Charles Kenyon and directed by Wallace Worsley. New York City. 1920. A legless beggar pleads with the oncoming foot-traffic for spare change. Barely a nickel comes his way. But what these pedestrians don’t know is—this deformed derelict at their heels is none other than Blizzard, kingpin to the seedy underbelly of the Lower East Side. With an army of dancing girls at his beck and call, Blizzard is hell-bent on executing his master plan: Get his revenge against the prominent doctor who left him in this condition—and against the city that could’ve cared less. Enter the good doctor’s daughter, Sofie, an artist living in the LES. When she asks our vengeful vagrant to pose for a new portrait, completely unaware of Blizzard’s history with her father, the stage is set for a showdown between this trio. Three people. Four legs. One game of revenge. 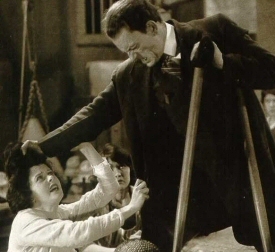 Inspired by the novel “The Penalty” by Gouverneur Morris, and its film adaptation, starring Lon Chaney, written by Charles Kenyon and directed by Wallace Worsley. "The Penalty" is a commissioned piece by The Apothetae, along with Dixon Place. The Apothetae is a company dedicated to the production of full-length plays about the "Disabled Experience."